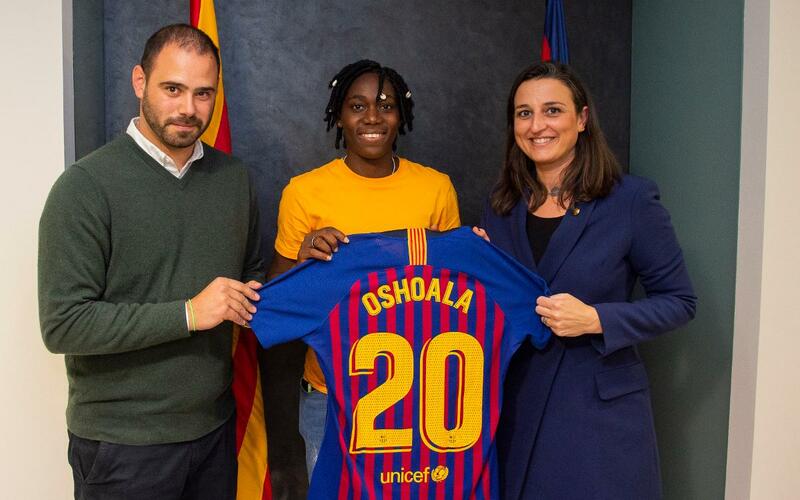 The 24 year old Nigerian arrived in Barcelona on Thursday morning for the routine medical checks and then signed her contract in the president’s office at the Camp Nou in the presence of the director responsible for the section, Maria Teixidor, and sports manager Markel Zubizarreta. Oshoala has been named African Footballer of the Year on three occasions (2017, 2016 & 2014) and won the Golden Boot and Golden Ball at the U20 World Cup in 2014 and was top goalscorer in the Chinese Super League in 2017. She’s quick and powerful (1.73 m and 70 kg) and has previous experience in European football at Arsenal (2016) and Liverpool (2015). “This is obviously one of the best clubs in the world. The team has a great history and wonderful football mentality”. “My goal is to strengthen the team and help them to win and make history. This is a fantastic opportunity because I’m sure something big will happen here”.